If you run an Internet business, you got to stay in business. Truly a few countries outside the USA have better Internet access systems. Thailand, Guatemala, Philippines many countries with Expatriate Colonies. What redundant systems for Internet access do you have? Can you stay in business 24/7? Many people believe South Korea to be one of the most connected countries on the planet. This may be true, but the reason is simple, it is because everyone allows their router open and available to be shared. 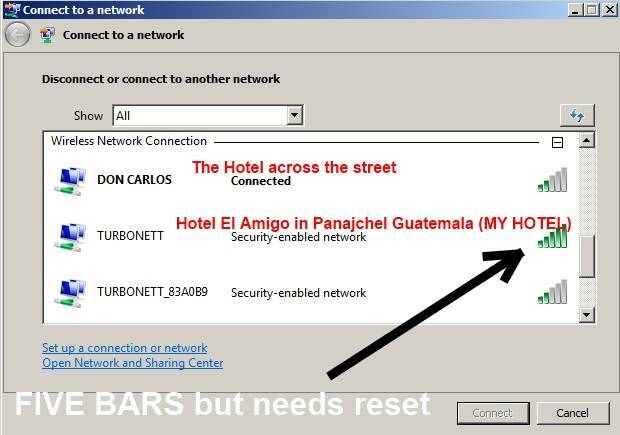 Guatemala is a Five Star Internet Access country. 2. Hotels have unlimited WIFI in many Hotels. 3. A person can buy a USB Wireless Internet Modem with Tigo the local Internet, and I believe available with Claro. 4. I can enter restaurants, bars and use Internet for free. The only negative star is there is NOT 24 Hour Internet Café's here in Panajachel on Lago Atitlan in Guatemala. I am TOO complacent here in Guatemala, I have become lazy. I move around between three good or great Hotel here on Lago Atitlan. Both cost 165 USD per month, I am presently in Hotel El Amigo, a little brighter and cleaner, but less sociable and not a family. I enjoy using the Kitchen at Posado Don Carlos, but the place is noisier because of a church singing too often. Hotel San Antonio in San Pedro, on Lago Atitlan for about 145 per month. Ok, for the last two months, there has been no hiccups with Internet here in the Hotel El Amigo. Today there is a problem, after shutting off my WIFI, trying to reset the IP, and then rebooting, etc. I decided to disconnect. I then went to search for the same signal --- Ooops, it connected to Posada Don Carlos across the street. I accidentally hopped signal and will borrow that connection until my Hotel WIFI Internet access start to work again. If there is a long-term Internet access problem, I will go down to Tigo and buy a USB Wireless modem to stay in business. All in all, there is almost always a way to stay in business between the Hours of 7:00 am and 11:00 pm, being that I wake up at 4-5:00 am, my life is more difficult on Lago Atitlan. Then maybe you need to plan for failures to happen, there is no such thing at a perfect world. NOTE: I know I am in my dream Hotel for Internet Access when I walk into the Hotel and see the children of the owner using the Internet. This is an almost 100 percent guarantee the owner will make it work quickly when broken. The desire to keep their children happy trumps client needs. Both the El Amigo and Don Carlos have children using the Internet.